Jerry Deveau chose a life less ordinary – a purpose driven existence punctuated by transient jobs, travel abroad, jail sentences, substance use disorders, relapses, and then recovery. Sharing in his experiences was his adoring wife, who passed away suddenly four years ago. Her memory is sobering, and Jerry is committed to staying clean in honor of her life. 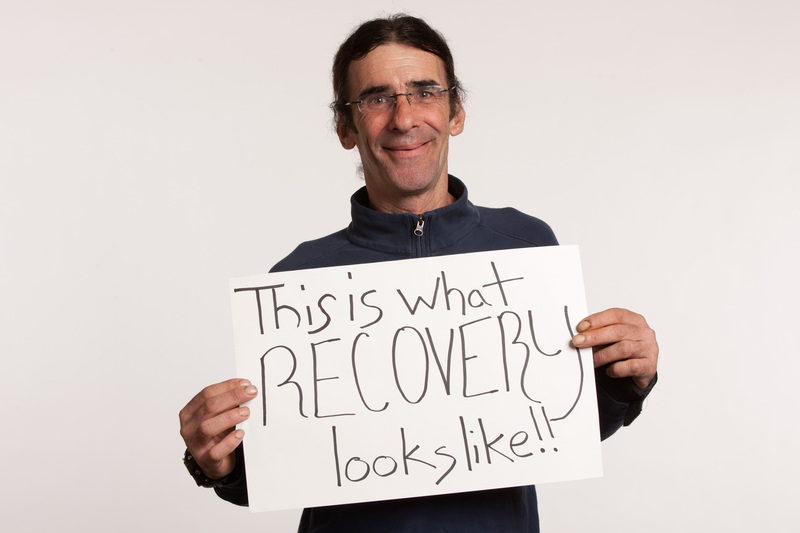 “We stayed in our addiction together…and we quit together.” This year Jerry is celebrating 14 years of sobriety. I’m not having a hard time staying clean here. There’s so much to do and so many things to see. There’s really no time to dwell in the drug infested areas. What Jerry likes best about Seattle is that he “can blend right in here.” His long dark hair, slender build, and austere, causal style gives him a striking resemblance to Steve Jobs – circa 1965. He’s an adept web developer, specializing in open source coding. 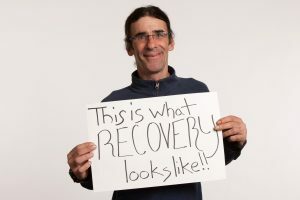 Jerry has done freelance work for several tech firms in Washington State and despite the overwhelming desire to capitalize on Seattle’s ever-expanding technology market, he dedicates up to 40 hours a week volunteering as a Member at Recovery Café to prevent relapse and encourage growth in his Café comrades. “There is no growth in substance abuse,” Jerry states. I want to thank everybody at Recovery Café for all that they have done and continue to do for me. You can bring someone out of their dark moment when YOU are lifted up – and you’ll be all the more rich for it. “I feel needed here and I feel wanted – even without the posters,” he laughs. “It’s nice to volunteer and it’s a structure that I need.” Jerry is closing in on retirement age and he shuns the idea of leisure time or languishing. He models his ideal post-retirement life on his busy, but rewarding day-to-day schedule at Recovery Café. Similar to how a Buddhist monk reconditions his mind with ritualized behaviors, Jerry practices a health-giving lifestyle through the deliberate repetition of humble chores: washing dishes, cleaning bathrooms, and keeping the Café’s shared spaces tidy. After a while repetitions become second nature. It’s become a lifestyle; at first it was forced, and now it’s a chosen lifestyle. I like it better being clean. I’ve only got a few brain cells left and I’m keeping both of them. We regularly checked in every week and when it was my turn I always talked about struggles, struggles, and more struggles. They helped me get cleaned up and think better of myself. One person helped me get into a shelter, another gave me shaving cream, and another told me where to get bus cards. If any of them need anything, they only need to ask. We are all like that about each other. The Café’s warm atmosphere, and even warmer food is huge plus for Jerry. He recently fell ill and lost 25 pounds from his already slender frame. “I’m gaining it all back here,” he said, chuckling. Although Jerry will have steady meals as long as he remains a Member of the Café, his housing situation is less stable. He stays in a night shelter on Alaskan Way for homeless men aged 55 and older – a group that is particularly vulnerable to inclement weather, violence, and illness. Jerry didn’t think he’d make it to the now, but his doctor assures him that he will continue living into old age. Jerry wants to use his time wisely – to help others who are floundering to get on solid ground. “When I come out in the morning and every time I look out onto Alaskan Way, I see all the cargo from overseas and it never ceases to amaze me.” Ideally, Jerry would like to beautify the waterfront where he stays by getting a park bench with a plaque engraved with his wife’s name. She is the first person that I’ve ever grieved for in my life, and I’ve lost a lot of friends in the war on drugs. She’s the one that got me clean; I continue to grieve for her every day. That’s why I stay clean, so her death was not in vain.